Guys, look what happened? Would you just look at what’s happened to my blog?! I can only assume Goldilocks is behind this. Just last night, she was over for a bowl of soup and she fell asleep in my bed. AGAIN! But, I fell asleep, too, and I think she must have slipped something in my drink, because the next thing I knew, it was morning and she was gone. I logged into my blog and this is what I found. Goldilocks is a HACKER! Am I in a time warp or something? The Bumble Files? Didn’t I change the name of my blog once or did that even happen? Now, I don’t even know. I lose track of time when I hang around Goldilocks. She has that effect on my me. What year is it again? 2013? Did I miss a year? Who does she think she is changing my blog without consulting me first? First let me catch my breath, as I’m just seeing all of this for the first time. Hmm…I see a new picture on the sidebar there. I’m a Work In Progress, huh? That’s all she can come up with? After everything I’ve done for her?…The late nights, the soup, ALL THE SOUP. You’ve heard she’s a picky eater, right? All true. And letting her sit anywhere she wants, usually in my favorite chair, which you know, you do so at your own risk. I mean, look at her latest disaster. LOOK at this! I know she sat in this chair. I just know it. 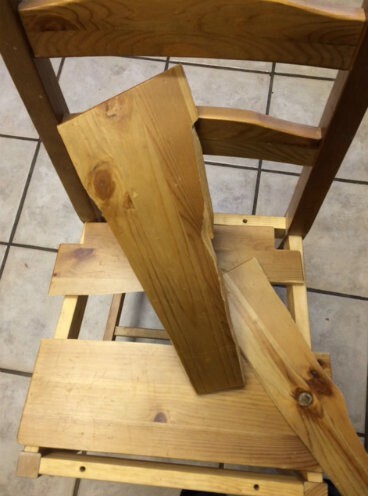 Goldilocks is an expert at breaking things. This is how she left it. She’s whacked! Here’s evidence. She’s a breaker…she’s a hacker. Out of control. Only she leaves things shattered in bits and pieces. But I daresay, this blog is kind of growing on me. It’s colorful and bright. It looks like the address will work fine if you search or type in either amyreesewrites or bumble files. Secretly, underneath AmyReeseWrites, I am still The Bumble Files; I’m just multi-layered now is all. The domain name can stay. Why hassle that? Goldi has redone my “About” page for the Bumble Files. She’s put in Categories. I’ve never had those. I was nearly approaching the 100 mark in number of categories. She’s been busy! I must give her some credit. I think she just wants me to have a little fun is all. She means no harm…I think I’m just going to keep it! So, there you have it. I am now THE BUMBLE FILES! Peace. Oh, and there she is now. I must catch her! Tootles for now. What does permanent mean? Ha ha. Amy – I am speechless – I know you are a wonderful blogger – You are always hidden with surprises!! I always liked The Bumble Files! Do you remember I told you that for ages I had misread and thought it was The Bumble FLIES , and even though I have known for a long time now that it isn’t, I still always get the image of a bumble bee in my mind when I see the name! I like the Bumble Flies! And the Bumble Files, too. Ah, perfect! Goldilocks thinks so…Thanks. On my iPhone, all formatting is pffft so I can’t tell that you’re doing the timewarp. But what comes next when the three bears show up? How does it look on the iPhone, V? The three bears defer to me, so they’ll be cool with it! It’s just text. No formatting, Goldilocks. Oh good. You see words! Yeah, better than just dots and spots. Well, aren’t you all bright and shiny new this morning? Not completely new…shiny old doesn’t sound right. Bumble Files works for me and like a rose, Amy Reese by any other name will still be will till be awesome. Thanks for coming to the shiny-like-new blog. Oh, you’re the sweetest, Michelle. Where would I be without you?! You’re always pumping me up. Thank you. Well, I love the look – bright and clear, and it’s inspiring me to do some clean-up on my own blog. Plus, I love the old/new title – I think it’s great. Thank you, Trent. I feel Goldilocks has done a pretty good job with the clean-up! It really needed some organizing. I’m glad you like it. I like it… and feel like doing some housecleaning of my own now… which means I will ask my wife to help, becasue she is ten layers smarter than me. I’m really excited that Goldilocks did this now and that she wanted to do all this cleaning for me. She must really care about me. 🙂 It feels good, Trent. I recall your wife helped you last time and that she did a spot-on job! Love the picture in the header! Thanks, Mark! I’m glad you like it. Does it look familiar? It does but I can’t place it. Well, I believe it’s Old Town Folsom, Sutter Street Grill because Goldi and I had breakfast there this past weekend. Yes, that’s it! You’ve been spending way too much time with this Goldi. I figured it was an “old town” somewhere. She just shows up and I’m supposed to just drop everything. Like I don’t have a life. Hmm…perhaps Goldilocks has you under her spell, especially if you’re in some kind of timewarp mode. Goldi could be present, sneaking around. She’s like that. Have you noticed anything broken? You sure keep us on our toes… but surprises add so much to life! Love the header! I keep myself on my toes, or er…Goldilocks doesn’t help either! Thanks. I’m so glad you like it. Thanks, Patti! I sure hope so. Goldi took care of business. And I gotta say she did an EXCELLENT job!! Your new place, because I think of blogs as a cyber home, is super cozy and crisp. Welcome back Bumble Files. We missed you!! P.S. The Bumble Files has always held a special place in my heart. I first ‘met’ you on the BF About page!! Awww thank you, Anka! That so extra sweet of you to say. That was honey sweetness! I guess Goldi has her own blog or something. She seemed to know things. Thanks for the warm welcome back. It feels like home again. You rock those glasses, Amy!! A little bit of mystery, and lots of edge. Hope your week is off to a good start. I’ve been fiddling around with my blog too much. Guess with the New Year, comes a new space. My eyes are burning from editing all those gosh darn WP widgets!! Oooh, yes, lots of edge. I like that. Just keep talking to me. I know who to come to when Goldi gets me down. Although, I can hardly be mad at her for anything! Interesting how the New Year does that to people. I thought about changing and then it happened suddenly, you know with Goldi going behind my back like she did. Goldi confessed today that those widgets kept her up all night. Nothing is ever quick, is it? Goldilocks did a good job! I noticed the work in progress part right away and can relate. Missing a year isn’t so bad – I think I’m missing a decade in there somewhere. Make sure to keep Goldilocks away from those chairs though! Hi ya! You are loved girly girl!! Awesome blog! I must admit, Amy, I had a bit of a flashback moment when I saw the Bumble Files, wondering if I was going crazy or you’d be running two blogs all alone. 🙂 Dang that Goldilocks, always breaking things. Good luck, Bumble-in-charge! I couldn’t possibly run two blogs, David! 🙂 I have a hard enough time with one. I will do my best. Thanks. I hope it was a good flashback. Ha! That is funny. I saw that Miss Four Eyes had come back, too! Sometimes, I think I should divide my blog, but somehow I don’t think it would work. We’ll see. 🙂 Sometimes, I just have to mix it up for myself, to feel like something is fresh and new. Yeah, I know that feeling. I like to try different things, even if they don’t prove as popular sometimes. Variety is good.